All show and no go - absolutely not! 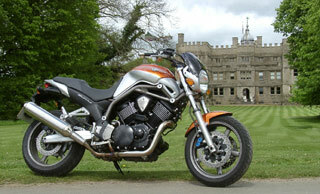 To be perfectly honest I had hoped that I would not get the Bulldog as a test bike! I have read things over the past couple of years about it in various publications and all seem to say the same thing, it's not a bike we would want to own....but recently I asked myself why? So after a chat with Yamaha in Weybridge we sorted out a nice new Bulldog in a pretty vivid colour scheme for a full test to see just what this somewhat unusual bike was all about. The Bulldog is a pretty muscular-looking naked V-twin roadster weighing 229kg dry and propelled along by a relatively basic 65ps, two valves per cylinder, air-cooled engine! Surely this is going to be the most boring test of all time, It's no match for serious street bikes like the Ducati Monster S4 or the Speed Triple from Triumph - at least not until you look at the price, and the way it is built. 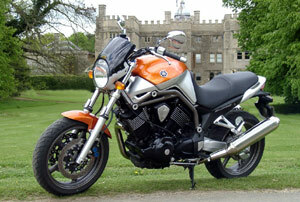 It is also the first Yamaha designed and produced by one of its Country Partners in Belgrada, Italy. The Belgrada facility, beyond being the Italian import point, now possesses the manufacturing facilities to bring a fully formed bike to the world marketplace. Design work was accomplished in Amsterdam by Product Planner Martin Grill, the "creator" of the Bulldog. The brief was to offer a bike with a wide range of usage, including "sporty riding on smaller roads, and long distance touring." Now let's not forget, as the average age of motorcyclists around the world continues to rise, there's a large proportion of older riders looking for a bike that's simple, stylish, practical and fun to ride. Not a test of human endurance to ride a modern Supersports bike like a GSXR 1000 or R1, but to ride at a respectable pace and be able to have something left in reserve over and above the deciding road conditions. Before you slap on the term 'Old Man's Bike' with a sneer and a laugh, don't forget that in the Western world 'mature' forty something riders outnumber those in their twenties, indeed the largest motorcycle manufacturer in the West has made a brilliant success of tailoring its low-tech V-twins and has a following second to none in the bike world. 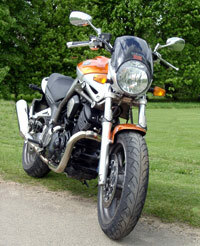 You could say that there is a case for calling the Bulldog a 'EuroHog', because it provides the enhanced level of performance and improved handling dynamics required by European roads and conditions, while still offering the first rung on the ladder to the same non-threatening, laid back riding style that a Harley does. That impression was reinforced to me when I fired up the Bulldog for the first time, and it settled into an idle with an offbeat, slightly odd thud through the twin exhausts. Blip the throttle and you get an unmistakable V-Twin crack, shut it and the pipes growl, even with the standard cans on. Yes the exhaust note on the Bulldog is absolutely brilliant, it certainly adds immensely to the overall riding experience of this much underrated bike. So on to actually riding it. Select first gear on the five speed gearbox and accelerate away from rest, you are greeted to a locomotive-like takeoff which carries on through the gears up to the red-line at 7,000rpm. This resembles a Harley so much with the shed-loads of torque available, and the unmistakable vibrations lend it yet another parallel with the infamous 'Milwaukee Iron'. Call it character, and remember there are potential Bulldog owners that have either spent their entire life on two wheels, so they expect a little shake, rattle and go, or they have come to bikes via the driver's seat of their Volvo, Ford or Nissan, in which case the last thing they're looking for is a two-wheeled car. This is not to say that the Bulldog rattles and shakes, it is a very respectable bike to ride and is easy on the vibes - but it's not boring at all, unlike your average Volvo, Ford or Nissan. The engine is the well-proven 75-degree V-twin engine last used in the XVS1100 Drag Star, but whose heritage starts way back in 1981 with the Yamaha TR1. Yamaha have tweaked it just slightly to boost horsepower to 64 at a loafing 5500 rpm, and given it a huge torque figure of 65lb/ft which seems to start from rest to about 4500rpm. The team designed a steel twin backbone frame that loops over the engine and down to the aluminum swingarm pivot. There, they've attached a CAST single unit dual-sided swing arm, that also houses the drive shaft and attaches the final drive unit, very neat indeed. That allows a single rear shock which is cheaper, usually more effective, and leaves super clean lines at the rear of the bike. This combination of a custom style engine in a sporty road chassis gives a great sensation, in particular when travelling down smaller 'B' roads. You really don't need to change gear a lot, since this engine pulls strongly even from the lowest revs. It's a real pleasure to swing through corners and feels stable and controllable in almost every situation. So much so that you are far more aware of your surroundings, and you suddenly discover that you have seen something you have always missed before, or a small cafe on the side of the road. I think the Bulldog fits the mood of many riders today, who are looking for a stylish and yet sporty machine, but at the same time enjoy a cool and relaxed riding style. Riding the Bulldog is a pleasurable experience all round. Although the rear shock and the 43mm forks are non-adjustable, it doesn't detract from the overall ride quality, the road holding is great and is both precise and comfortable over almost any type of surface. You would think that a bike weighing in at 229kg would actually feel heavy when both moving it and riding, but it really doesn't! It's easy to ride at the slowest speeds and possesses that ability for feet-up ultra slow town riding as the combination of a low Centre of Gravity and bike balance is near perfect. The raised bars on pullback risers are well placed, and the resultant riding position allows you to cruise easily at well more than motorway speeds without having to hold on too tight. It's a different story at the top end of the speed range though, which is about 130mph (managed in the interests of research!). Here the mini-screen does actually have an effect but it's not a speed to travel at for too long as you are actually bouncing off the rev-limiter in 5th! 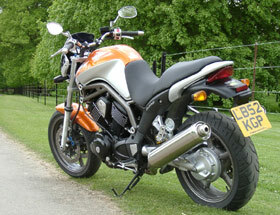 If you want to ride a sports bike then don't get a Bulldog, ride it like that and you've missed the point. This is a bike where it pays to use the torque curve and change up at around 5,000rpm taking advantage of that smooth, unthreatening power delivery. There's more than enough horses to grab your interest, without giving you that feeling that you're struggling to control a stampede. The Bulldog is a great bike, what more can I say! Living with it should be a pleasure, the spread of power and torque is so wide you don't have to change gear that often - just go with the flow and enjoy the ride. It's a very comfortable bike with that sitting-in-it feeling rather than the perched version, it handles well and it has great brakes directly from the R1. Maybe these are a bit of overkill but they really do the job and give you even more confidence to haul the Bulldog down in super quick time. Yamaha have created a true user-friendly product here with a lot of Italian form and style. This, together with the Japanese function, means attention to detail. The mirrors are placed where you can actually see something other than your shoulders, there's a whole host of aluminium rather than plastic parts all over the bike giving a sense of substance, everything is neatly tucked away at either end, and it has an adjustable brake lever which is a welcome touch on a budget-conscious bike. Yes, the Bulldog name is a good one, not just because of the tough-looking somewhat arched styling, not just because the engine sets a visual standard, but because beneath it all is a bike that gives you great pleasure. We're not talking Doberman here, we're talking about what is after all a big old 'softie' of a bike! The Yamaha Bulldog is a bloody good motorbike. There, I've said it. This may not be a popular opinion to hold, and certainly among our esteemed colleagues in the press it is far from fashionable, but it's no less true for that. Consider this. Everyone who commented on it, whether biker or otherwise, said it looked good. Scoff if you will, but for a bike like this that is incredibly important. Next, every time I rode it, wherever it was, whatever the road, I grinned. In fact, at times I grinned so much my face hurt. This bike is immense fun. It handles far better than it has any right to, it goes quite extraordinarily well, it has brilliant brakes and it makes a good noise. As far as practicality is concerned, it's as comfortable as anything else in the class, it's got decent lights and it's even OK for a pillion. Well, sort of, anyway. Shaft drive means no need to adjust anything back there and the enormous but totally understressed engine should go on forever. Biking is all about enjoying yourself, and the Bulldog allows you to do that in spades. It lapped up every type of road that I threw it at and did it in a way that was still huge fun. Not as fast as an R1, for sure, but it allowed me to travel at a rate which would give my licence at least a faint chance of surviving a skirmish with the law while still having that stupid grin plastered all over my face. Although the Bulldog is excellent as it is, I'd like to firm up the suspension a little prior to taking it on a track day. It would infuriate the sportsbike boys to be overtaken round the outside of, say, Clearways by a cruiser. And that would make me grin even more.